By John C. Toman. Posted March 4, 2012, 3:36 PM. Warm days this weekend are giving a hint of spring, but don't expect them to continue. High pressure and offshore flow that have frequented the region this winter have led to very warm temperatures Sunday in Southern California's inland valleys, and even near the coast. Temecula (90°F) was the warm spot Sunday afternoon, closely followed by De Luz (89°F), Wildomar (89°F), Fallbrook (88°F), Lake Elsinore, Menifee and Riverside (all 87°F). Out west, Simi Valley registered 84°F. City Heights, east of Balboa Park in San Diego, was a warm 86°F. Dry offshore flow was also present Sunday, as it has been the last couple of days. 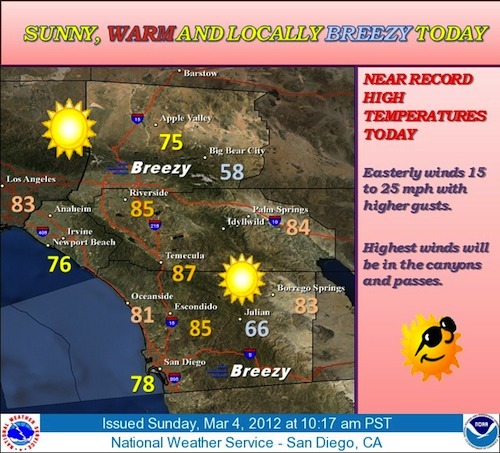 Breezes were strongest Sunday morning, mainly in the inland areas, and are predicted to subside through Monday. Monday was expected to be warm as well, but a few degrees cooler, then a change in the weather pattern is forecast for Tuesday. Light rain or drizzle is expected Tuesday, as a system travels inland past the region. Moisture will be limited. Mainly we should see more clouds and much cooler temperatures in the upper 50's to lower 60's. Fair and warmer weather will resume later in the week - just not as warm as this weekend.